Mexico had given two pairs of brothers to Major League Baseball as of 2018: the Romos (Vicente and Enrique) and the Treviños.1 Of this quartet, U.S. fans saw the least of Carlos Treviño, also known as “Bobby.” The outfielder played in just 17 games for the California Angels in 1968, and he spent just three of his 16 summers as a pro north of the Rio Grande. In the spring of 1970, finding no way up in the Angels chain, Carlos went back home to continue his career. Carlos Treviño Castro was born on August 15, 1945 – not 1943, as even Mexican references have previously shown.2 His parents were Carlos Treviño Támez and Aurora Castro Mata. The Treviño family lived in San Nicolás de Los Garza, in the Monterrey urban area. This industrial city in the northeastern state of Nuevo León became one of the bastions of Mexican baseball starting in the early 20th century. In 1958, Carlos was the catcher for the Monterrey team that won the Little League World Series for the second straight time. (Knowing that his year of birth was 1945 assuages qualms about eligibility – he turned 13 several days before the title game.) The squad starred future big-league shortstop Héctor Torres, then a pitcher.7 In the championship game, Torres won 10-1, backed by four homers. His batterymate, Treviño, hit two of the team’s seven homers during the competition. Monterrey’s 1957 team inspired two movies, a 1960 Mexican production called Los Pequeños Gigantes (“The Little Giants”) and a 2008 U.S. film called The Perfect Game. Though the 1958 team cannot boast any cinematic lore, it is still fondly remembered at home. In 2008, many members, including Treviño, got together for a golden anniversary panel at the Mexican Baseball Hall of Fame, located in Monterrey. Chita García finally signed Treviño for Mexico City in 1964, at age 18. By then, Carlos had become a first baseman/outfielder. As an adult, he stood 6’2” and weighed 185 pounds. Pictures of Carlos and his brother Alex Treviño when each was in his twenties show a strong facial resemblance. However, Carlos was four inches taller and 20 pounds heavier. Starting in 1973, Alex (who was born 12 years later) played pro baseball for more than two decades, including 939 major-league games with five teams from 1978 to 1990. Carlos Treviño got into three games with the Red Devils in 1964, going 2 for 7 (.286). That brief experience was his only association with a championship club in Mexico’s summer league. He spent most of the ’64 season with the farm club in San Luis Potosí, in the Mexican Center League. One of his teammates was a 16-year-old catcher named Paquín Estrada, whom Chita García had also signed that year. Estrada played just one game in the majors in 1971 but became a renowned ironman catcher and manager in Mexico. The latest available snapshot of 1964 Mexican Center League stats showed that as of July 25, Treviño was hitting .344, tied for fourth in the league. He had 7 homers and 78 RBIs in 109 games. The 120-game season closed on July 28, so these numbers are virtually complete.9 Treviño then played winter ball for the first time in Mexico. He and Estrada both joined the Navojoa Mayos, whose manager was Tomás “El Sargento” Herrera – their skipper in Mexico City too. The late Monterrey baseball historian Gerardo Castro wrote a capsule summary of Treviño’s career in 2008. In it, he indicated that Carlos played for San Luis Potosí in two seasons. There is good reason to believe this, but unfortunately The Sporting News did not run leader boards for the Mexican Center League in 1965, as it had the previous year. We do know, though, that Treviño played a large portion of the ’65 season for Mexico City. He hit .301 with no homers and 33 RBIs in 86 games. Johnstone got back for one game in early June but was then sent down to Seattle. From May 22 through July 6, Treviño started nine games, seven of those in center field. He pinch-hit six times and entered as a replacement twice more. He was 9 for 40 (.225) with a single RBI and one run scored. His one extra-base hit, a double, came in his best outing. At Anaheim Stadium on May 27, he was 3-for-6 against the Detroit Tigers as the Angels won 7-6 in 12 innings. The brief major-league experience of Carlos Treviño ended much as it began. As The Sporting News put it, “General Manager Fred Haney and Manager Bill Rigney have made a score of roster changes this season in an attempt to arouse a team unable to get above .500. 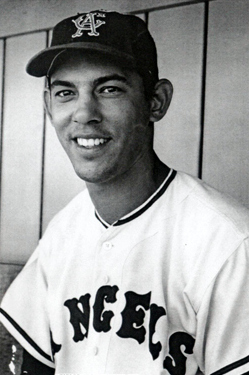 The latest additions were catcher Orlando McFarlane and pitcher Bobby Locke. . .The latest deletions were outfielder Bobby Trevino and pitcher Larry Sherry.”21 Treviño spent the remainder of the 1968 season at Seattle, where he went 0 for his first 18 and finished at .194-2-8 in 55 games. The winter of 1968-69 was a notable one for Treviño. With the Cañeros of Los Mochis, on New Year’s Eve 1968, he became the first batter in club history to hit three home runs in a game (many batters have since equaled the feat). Los Mochis also won its first Mexican winter title. Unfortunately, the Caribbean Series was on hiatus at that time. After the tournament returned in 1970, however, he did get to appear in the 1977 edition. He was a reinforcement for the Mexican champions, Venados de Mazatlán, and served as a designated hitter. He was part of Mexico’s coaching staff on other occasions. The Angels restored Treviño to their 40-man roster after the 1969 season ended.28 However, he never played again in the United States. In late March 1970, the El Paso Herald Post indicated that Carlos was going to the Hawaii Islanders, but shortly thereafter Del Rice said that the popular Mexican would be back in El Paso. That may have been handwriting on the wall. He appeared in some exhibition games for the Sun Kings, but on April 13, the Herald Post confirmed Rice’s earlier rumor that the Angels had sold Treviño’s contract back to Mexico City. In 2012, however, Treviño said, “The matter was decided by wages. They didn’t give me a raise, and I preferred to play at the Triple-A level in Mexico.” He went on to play ten more summers at home. From 1970 to 1972, he played with the Red Devils. Always more of a line-drive hitter, he posted his two best annual home run totals in 1972 (with 17) and 1970 (with 12). However, his long-ball output dipped to just one in 1971 as he played in only 86 games. He hit consistently for average (.309, .309, and .299) and drove in 189 runs. In addition to Francisco Estrada, Treviño had other teammates who had played in the major leagues or later would. They included Choo Choo Coleman, Jorge Rubio (another Mexican Angel of the ’60s), and future hitting coach Tom Robson. From 1973 through 1975, Carlos played for Unión Laguna, the club representing the Torreón metro area. His offensive totals were largely similar: a .288 average with 27 homers and 210 RBIs. His most notable teammate there was Minnie Miñoso, aged 47 in 1973 and still a good-hitting regular. Treviño spent 1976 with three clubs (Coahuila, Saltillo, and Nuevo Laredo). It was a less successful season: .245-3-40 overall. There, too, names familiar to U.S. fans were visible: fellow Mexican Celerino Sánchez; an American in Hal King; and a couple of Panamanians, Adolfo Phillips and Ivan Murrell. Treviño then became a player-manager. In 1977, he was skipper in Tabasco for part of the year; the other manager was Napoleón Reyes. He hit .217-1-23 in 97 games. In 1978, serving as a player only, he returned to Nuevo Laredo (.234-1-23 in 52 games). In 1979, he and old teammate Felipe Leal were managers in Tampico. As a player, he hit .230-4-29 in 90 games. He concluded his career in Mexican summer competition with 70 homers, 608 RBIs, and a .283 average in 1,214 games. In 1980, a strike-shortened season in Mexico, he managed Toluca (a city that has hosted a Mexican franchise in only two years, the other being 1984). After his pro career ended, Treviño continued to enjoy playing baseball and softball for fun in the Monterrey area. He went to work as a driver for Hylsamex, a steel processor that was merged into a broader Latin American steel company, Ternium, in 2005. He held that job for 28 years until retirement. Carlos Treviño married María Elena Flores de Lira on August 31, 1973. They had three children: Carlos, María Gabriela, and Marcela. The Treviños still made their home in Monterrey until Carlos died on December 5, 2018. According to Jesús Rubio, he had been suffering from lupus for about a year. His passing was widely noted in the Mexican press. Continued thanks to Jesús Alberto Rubio in Mexico for his input. Jesús spoke with Carlos “Bobby” Treviño (one of his favorite players of that era) by telephone on May 8, May 9, and May 16, 2012. Special thanks to Sr. Treviño himself and to Alex Treviño for arranging the contact. Additional thanks to Mike Floyd for his input (June 2015). Jesús Rubio’s story about this player’s life and career, “El formidable Bobby Treviño,” may be found in different forms on various web pages, but the most complete is on his section of the website of René Cárdenas, La Estufa Caliente (http://www.laestufacaliente.com/articulos/Jes%C3%BAsAlbertoRubio/). It has a deeper focus on Treviño’s career in Mexico. 2 Jesús Rubio with Carlos Treviño, telephone interviews, May 9 and May 16, 2012. 3 Jerry Waggoner, “Trevino Ties 46-Year Record with 37-Game Hitting Streak,” The Sporting News, June 7, 1969, 39. 4 Gerardo Castro, “‘Bobby’ Treviño.” El Regio (Monterrey, Nuevo León, Mexico), March 12, 2008, 9. 5 Telephone interview, Jesús Rubio with Carlos Treviño, May 8, 2012. 7 “Former Mexico Little League Sensation Now With Astros.” Associated Press, May 8, 1968. 8 Telephone interview, Jesús Rubio with Carlos Treviño, May 8, 2012. 9 The Sporting News, August 8, 1964, 9. The 120-game season closed on July 28, so these numbers are virtually complete. 10 The Sporting News, June 18, 1966, 45. 11 “Great Catch Ends Spree,” The Sporting News, July 16, 1966, 57. 12 “Milkes Found Papa Torres Too Old, but Deal for Son Wins Seattle Okay,” The Sporting News, May 7, 1966. 13 Bob Ingram, “No-Hit Game Snaps Leal’s Losing Skein,” The Sporting News, May 27, 1967, 33. 14 Ross Newhan, “Angel Angles,” The Sporting News, November 12, 1966, 36. 15 Ross Newhan, “Angel Angles,” The Sporting News, March 4, 1967, 27. 16 “Trevino Works on Speed,” The Sporting News, April 8, 1967, 38. “Trevino” without the tilde (~) is used here only from U.S. newspaper quotes that omitted it from the proper Spanish spelling of the family name. 19 “Angels Recall Bobby Trevino,” Associated Press, May 22, 1968. 20 “Trevino Is Now California Angel,” El Paso Herald Post, May 21, 1968. 21 “Rig, Haney Try Shakewell System on Faltering Angels,” The Sporting News, July 28, 1968, 25. 22 Ingram, “Lee Trevino a Whiz…And So Is Bobby!” op. cit. 24 Ross Newhan, “Angel Shakeup Due -- If Rigney’s Still Manager,” Los Angeles Times, May 23, 1969, D1. 25 Bob Ingram, “Tanner No. 1 Angel Candidate,” El Paso Herald Post, June 7, 1969. 26 “Winder Winners,” El Paso Herald Post, April 23, 1970. 27 E-mail from Mike Floyd to Rory Costello, June 25, 2015. 28 John Wiebusch, “Angel Angles,” The Sporting News, October 11, 1969. 29 Bob Ingram, story headline unavailable online, El Paso Herald Post, April 13, 1970, 18. 30 Gordon Edes, “Alex Trevino Is Just Happy to Be in Los Angeles,” Los Angeles Times, December 18, 1985. Jesús Rubio with Carlos Treviño, telephone interview, May 9, 2012.